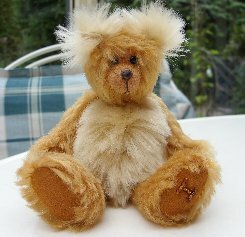 This lovely 5 1/2" bear is Camborne and he is perfect for those of you who like your bears to be Teddy Bear coloured. He is made of gorgeous honey gold Schulte mohair, soft and silky, whilst his tummy and ears are made of longer, luxurious, soft butterscotch coloured Schulte mohair, the length of this fur gives Camborne great ears. We have filled him with steel shot so he is nice and heavy, he has a dark brown stitched and varnished nose, shiny black German glass eyes and honey gold ultrasuede pads and paws. His tummy button is cream with white polka dots on it, he is a really adorable little bear and I hope that you like him too. Camborne, who is part of our Cornwall Collection, costs £39 plus postage. Please note that as with all our bears, Camborne is not a toy and is not suitable for children. Sorry - Camborne has been adopted.